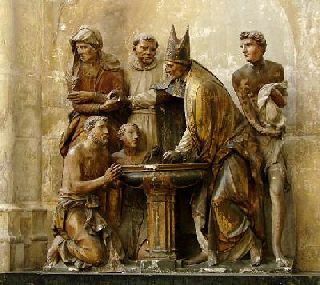 Baptism of Augustine of Hippo as represented in a sculptural group in Troyes Cathedral, 1549, Troyes, France. The practice of baptizing infants has come to signify for us that God's love and care for us precedes our understanding. By the 1500s, groups of Christians known collectively as "Anabaptists" were questioning the practice of infant baptism. They believed that conversion into Christianity required a level of understanding that an infant could not give, and that baptism as a promise that the child would be raised as a Christian did not follow the pattern of baptism found in Scripture. Anabaptists today (for instance Baptists, Disciples of Christ, Mennonites, and Brethren) only practice "believer's baptism" that is the baptism of people old enough to respond for themselves about their faith. This removes the need for confirmation as a separate ritual. The Anabaptists were influential in making education, understanding, and belief an important part of preparation for confirmation rather than the presence of a bishop and the laying on of hands. One of the results of the break in the western church into Protestants and Roman Catholics is the lessening of the influence of ordained clergy among Protestants. In the Roman Catholic Church, bishops still trace their office back to the Twelve Apostles and so their actions tend to take on the authority of the Apostles. Therefore their role in the ritual of confirmation is very important. Even in Protestant churches that have retained the rule of bishops like the Episcopal Church or Lutheran Churches the role of the bishop in confirmation is central. 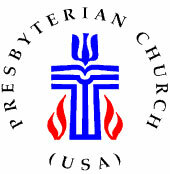 In the Presbyterian Church (U.S.A.) and other churches from our branch of the reformation, we understand the passing of the Holy Spirit to be the work of God not dependent on the action of a specific clergy person. Therefore the ritual of confirmation is less important to us than the learning, understanding, and ultimately believing that precedes the worship service where you will be confirmed. c. declaring their intention to participate actively and responsibly in the worship and mission of the church. . . .
For young people who have been brought up in the church, much of what it means to be a Christian and to take on the ministry of being a church member is already well known. You've listened in worship and in religious education classes and have an idea of why we have congregational meetings and of what happens at baptisms and at the Service of the Lord's Table. Confirmation is to organize all the stuff you've been learning over the years and fill in a few blanks you may have. More importantly it is to prepare you to make your own public profession of faith. I want you to go through the confirmation classes so that you understand what God did for you through Jesus' life and death and that God's love for the world includes you. I want to make sure you understand how you fit in the history and ministry of the church, and how you can be part of its ministry locally and around the world. Confirmation is about your becoming a member of the church and taking on the responsibilities of making the church do what God would have it do. When you were little, someone answered for you, now it is time for you to answer for yourself about what you believe, how you will treat others, and how you think the church should be speaking to the world.